It takes 2-3 hours to build, paint and fly. A great week long program! Perfect for younger students (ages 8-10), Scout and 4H groups. Takes 1-2 hours to build with no painting required. To Infinity and Beyond Bulk Pack Series includes skill level 1 bulk packs. These models require gluing, sanding, and painting. Learn how to take your skills to the next level. Please contact us with any questions or if you would like to place an order. 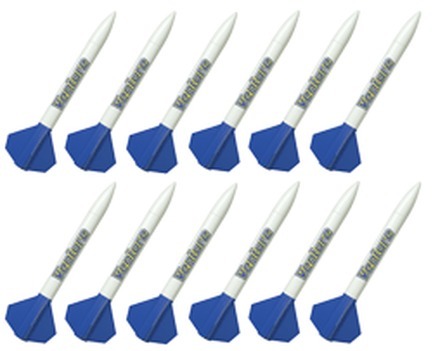 There are 12 rockets included in every bulk pack. The Fiesta is a 12 inch compact rocket that has a streamer recovery system and balsa cut fins. It provides great learning experiences for ages 10 and older. Recommended engine is A8-3. The Razor is a rocket that has a tubular design and cardboard fins. The rocket is 12 inches tall and has a parachute recovery system. There is no painting required. Build it and get ready to fly. Suitable for ages 10 and up. Recommended engine is A8-3. Express your patriotism through rocketry with the Freedom Bulk Pack. This is especially great for scouting groups and schools. The Freedom rocket is 12 inches tall and has balsa cut fins with a parachute recovery system. It is recommended for ages 10 and older. Recommended engine is A8-3. Game Over is a rocket with attitude. With an aggressive design to match, it has balsa cut fins and stands at 12 inches tall. It has a streamer recovery system and is great for ages 10 and up. Fun rockets at discount prices. Engines provide the propulsion for your rocket. All engines are shipped by the U.S. Postal Service, Parcel Post-4th class mail. Allow 4-10 days for shipment. Standard Estes engine. Includes 24 engines, 24 plugs, wadding and 30 igniters. Great for heavier rockets. Includes 24 engines, 24 plugs, wadding, and 30 igniters. Real power. Will launch you rocket out of sight! Includes 24 engines, 24 plugs, wadding and 30 igniters. Twin engine combo pack for two stage rockets. B6-0 is the booster stage. B6-6 is the upper stage. Includes 12 B6-0 engines, 12 B6-6 engines, plugs, wadding and 30 igniters. The fastest path to lift off. 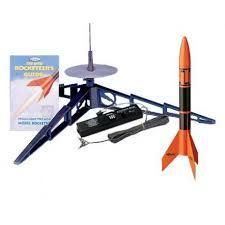 Includes 1 Flash Rocket (skill 0), 1 porta pad launch pad, and 1 electron beam launch controller. Includes 1 Taser Rocket (skill 0), 1 porta pad launch pad, and 1 electron beam launch controller.